Believe it or not, "lather, rinse, repeat" is not the best practice if you want healthy hair. 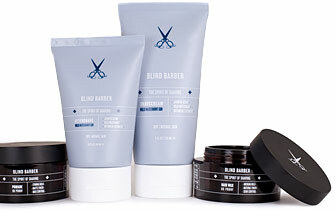 Just ask the gents from Blind Barber, the stylish Manhattan shop that puts the "bar" in barber. We met them at their handsome new west coast location where, like the original, a haircut comes with a free drink in the speakeasy (hidden in the back). Can't get to the shop? No worries. The guys have literally bottled their concept. Their new line of products are infused with cocktail ingredients and help you achieve that sharp yet natural look that's made the Blind Barber famous with in-the-know guys. 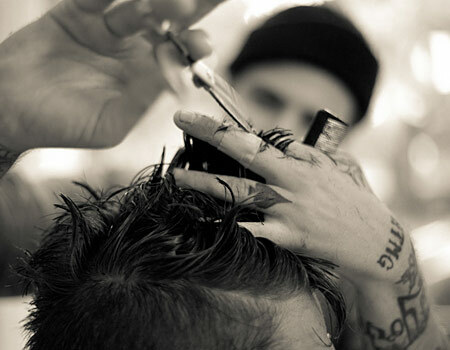 Here, co-owner Jeff Laub explains how to change your daily routine for fuller, healthier hair. I try not to shampoo my hair too much because it strips the natural oils and dries out your scalp. Once every three days is fine, unless you're really sweating. You can condition every other day and the rest of the time, just rinse with water to get the product out. Minimal product is key. Take a pinkie's worth, rub it in your hands until it's basically gone and then start at the base. Comb it all the way through with your fingers, then you go back and style it. Don't do it right out of the shower, it dilutes the product. Towel dry your hair until it's about 85% dry. We wanted to make products that connected people to the experience they got at the shop. But the alcohol isn't just marketing, there are some really beneficial ingredients in there. There's hops in the 60 Proof Wax, for example, which infuses the hair with protein and fights dandruff. That's what I use, because it gives the hair a little shine and lets me run my fingers through it all day.